This article is about the novel. For the TV episode ending the season adapted from this novel, see The Expanse (TV series). Leviathan Wakes (2011) is a science fiction novel by James S. A. Corey, the pen name of Daniel Abraham and Ty Franck. It is the first book in the Expanse series, followed by Caliban's War (2012), Abaddon's Gate (2013), Cibola Burn (2014), Nemesis Games (2015), Babylon's Ashes (2016), Persepolis Rising (2017), and Tiamat's Wrath (2019). 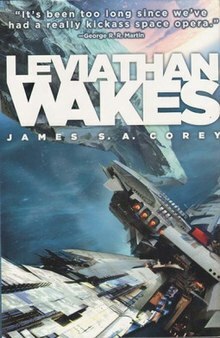 Leviathan Wakes was nominated for the 2012 Hugo Award for Best Novel and the 2012 Locus Award for Best Science Fiction Novel. The novel was adapted for television in 2015 as the first and part of the second season of The Expanse by Syfy. Leviathan Wakes is set in a future in which humanity has colonized much of the Solar System. Earth, governed by the United Nations, and the Martian Congressional Republic act as competing superpowers, maintaining an uneasy military alliance in order to exert dual hegemony over the peoples of the Asteroid belt, known as "Belters." Belters, whose bodies tend to be thin and elongated due to their low-gravity environment, carry out the gritty, blue-collar work that provides the system with essential natural resources, but they are largely marginalized by the rest of the Solar System. The Outer Planets Alliance (OPA), a network of loosely-aligned militant groups, seeks to combat the Belt's exploitation at the hands of the "Inners," who, in turn, have branded the OPA a terrorist organization. The ice hauling ship Canterbury (nicknamed the Cant by Belters) is en route from Saturn's Rings to Ceres Station when it encounters a distress signal. Five members of the Cant's crew are dispatched in a shuttle to investigate: executive officer James "Jim" Holden, a former officer in the UN Navy (UNN); chief engineer Naomi Nagata, a Belter; pilot Alex Kamal, a veteran of the Martian navy (MCRN); engineer Amos Burton; and medic Shed Garvey. They discover an abandoned transport vessel called the Scopuli. They find no trace of the ship's crew, but they do discover the beacon transmitting the distress signal. Suspecting that the ship may be a trap set by pirates, they take the beacon and begin returning to the Cant. Before they can make it, an unknown stealth warship arrives and, without warning, destroys the Cant with a nuclear weapon. Holden sends an angry message to the attacking ship, but it ignores him and departs. Based on the highly advanced technology of the warship and the discovery that the beacon from the Scopuli is of Martian origin, the survivors suspect the MCRN of being behind the attack. With the shuttle damaged by the debris field, lacking the necessary fuel or supplies to reach a port, and fearful that should they put out a distress signal of their own the attackers may return, Holden broadcasts a message out to the entire system implicating Mars in the destruction of the Cant, hoping to negate any attempt to kill them as part of a cover-up. In response, the shuttle is ordered to rendezvous with the MCRN battleship Donnager, flagship of Mars' Jupiter Fleet. En route, they receive a message from Fred Johnson, chief of Tycho Station, an engineering outpost and construction platform, offering his support. Johnson had been a highly-decorated commander in the UNN when he was ordered to brutally quell a Belter uprising, for which he was nicknamed the "Butcher of Anderson Station." Guilt-stricken, he had resigned his commission and become an advocate for the rights of Belters. As the shuttle makes its way to the rendezvous, they are pursued by a group of unknown ships. On Ceres Station, Belter detective Josephus "Joe" Miller of Star Helix Security, the Earth-based private security firm responsible for policing the station, is contracted to locate Julie Mao, daughter of wealthy magnate Jules-Pierre Mao, and send her back to her family on Luna against her will. When Holden's message reaches Ceres, riots erupt, which leads Miller to discover that the station's riot gear is missing. Aboard the Donnager, the ship's captain denies any knowledge of MCRN involvement in the attack on the Canterbury, and instead suspects that one or more of the survivors from the shuttle may have bombed the Cant as an act of OPA terrorism. The unknown ships that were pursuing the shuttle ignore warnings to change course and are fired on by the Donnager. To the surprise of the Martian crew, the ships return fire and are revealed to be the same stealth ships that attacked the Cant. Despite the fact that the Donnager is one of the most advanced and deadly warships in the Solar System, it is steadily overwhelmed by the mysterious enemy ships and eventually boarded. During the battle, a railgun round penetrates the hull, decapitating Garvey. Realizing that the Cant survivors are the targets of the attack, a team of the Donnager's Marine contingent are ordered to evacuate them. Although all of the Martian Marines are killed in the process, the four surviving Cant crew members are able to escape aboard the light frigate Tachi just before the Donnager is scuttled. Still unsure of who is trying to kill them, they decide to go to Tycho Station. There, the Cant survivors share what they've seen with Fred Johnson, who reveals that he is an influential member of the OPA. They receive new transponder codes for the Tachi from Fred, disguise the ship as a gas hauler, and rename it the Rocinante. Fred sends the Roci (as her crew nicknames her) to Eros Station to find an OPA operative working under the pseudonym Lionel Polanski. On Ceres, Miller has noticed an exodus of criminals from the station. He also discovers that Julie Mao's father had warned her of an attack in the Belt just two weeks before the destruction of the Cant. He is then confronted by Anderson Dawes, leader of the Ceres chapter of the OPA, who tells him that Julie Mao had joined the OPA and had disappeared while performing an important mission for them aboard the Scopuli. Dawes cautions Miller not to investigate the matter any further. Miller presents this information to his boss, Captain Shaddid, but she also instructs him to drop the case. Miller, however, finds himself obsessing over Julie and, when he persists, he is fired by Shaddid, who is revealed to be in collusion with Dawes. However, Miller is still able to access docking logs for all of the ports in the Belt, which he had been granted access to before his termination. Realizing that the Scopuli was the same ship mentioned in Holden's broadcast, he is able to discern that the Rocinante is the former Tachi from its registry information, and he departs for Eros. On Eros, Miller finds the crew of the Roci at a hotel where Lionel Polanski was listed as a guest. In Polanski's room, they find the body of Julie Mao covered in a strange organic growth. On her phone, Miller finds logs detailing the progression of her affliction, which seems to be fueled by exposure to energy and radiation, and the coordinates of an asteroid where one of the ships that attacked the Cant is docked. Before they can leave the station, a radiation alert is declared and station security begins herding people into radiation shelters. Miller recognizes some of the security officers as criminals from Ceres, who are wearing the missing Star Helix riot gear. He and Holden stay behind to investigate while the rest of the crew is sent back to the Roci. They discover that the people in the shelters have been dosed with an unknown substance and exposed to extremely high levels of radiation. As they make their way to the docks, they realize that the people in the shelters were infected with the same organism as Julie and the radiation was used to feed its rapid growth. They witness the infected attacking the security forces and spreading the infection to anyone who had been able to avoid the radiation chambers. They escape Eros just as it is being overrun. Fred contacts Holden and tells him that analysis of a data chip belonging to one of the dead Marines from the Donnager reveals that the mysterious stealth ships were built on Luna. Holden makes another public broadcast sharing this information, hoping to ease the tensions created by his prior implicating of the MCRN. This strategy backfires, however, and the UN, fearing that they will be blamed for the attack on the Donnager, launch a preemptive strike against the MCRN by destroying Deimos, site of a Martian military installation, which results in a standoff between the two sides. Miller and the crew of the Roci follow the coordinates from Julie's phone and find one of the stealth ships, called the Anubis, abandoned. In the reactor room, they find that the same organic growth that was on Julie Mao's body has consumed the entire remaining crews of the Anubis and the Scopuli, whom they had taken prisoner. They find a video explaining that the organism is a biological replication mechanism created by extrasolar aliens and placed on Phoebe which was then launched into the Solar System with the intent of reaching Earth and hijacking its early biosphere in order to create something, but was captured by Saturn's orbit, thus sparing Earth. Protogen, the corporation who had discovered the entity on Phoebe and dubbed it the "Protomolecule," orchestrated its release on Eros as an experiment, to try to find out what it was designed to do. They had carried out the false flag attack on the Cant in order to start a war that would distract the Solar System from what was happening on Eros. The Roci crew nuke the Anubis and return to Tycho Station, where they discover that data is being transmitted from Eros to a secret Protogen facility. They attack the station, with the Roci destroying the two stealth ships guarding it, and Miller and Fred leading a boarding party consisting of Fred's OPA soldiers, who are able to capture it. The lead scientist, Anthony Dresden, reveals that all of the scientists on the station had been "modified to remove ethical restraints," so that they could emotionlessly perform their research without empathy for the victims on Eros. He emphasizes the importance of understanding the Protomolecule, not only for its innate scientific value, but to protect against the clear threat presented by the aliens who created it. Realizing that Dresden's rationale is likely to be accepted by the powers that be on Earth and Mars, and his horrific research allowed to continue, Miller shoots Dresden without warning, angering Holden. "He was going to get away with it," Miller explains later, "He was talking us into it. All that about getting the stars and protecting ourselves from whatever shot that thing at Earth? I was starting to think maybe he should get away with it. Maybe things were just too big for right and wrong." Back on Tycho, Miller and Fred come up with a plan to destroy Eros to prevent anyone else from trying to obtain a sample of the Protomolecule. They intend to commandeer Tycho's main project, the massive Mormon generation ship Nauvoo, and crash it into Eros at the correct speed and angle to propel it into the Sun. Miller leads a team onto the exterior of Eros to plant bombs to detonate its ports, so that no one can get in and sample the Protomolecule before it is destroyed. He then decides to stay behind and die when they go off. However, just before the Nauvoo impacts the station, the entirety of Eros somehow changes course. The Protomolecule has some advanced method of spaceflight that can negate g-force and inertia. Eros then sets out for Earth, the largest source of biomass in the Solar System, at a speed that no human-made ship can match. Miller takes one of the bombs into the station to attempt to destroy its maneuvering capabilities. However, listening to the voices on the communication system, he realizes that Eros is being guided by Julie Mao, who believes she is piloting her racing pinnace. He finds her, her body morphed into the Protomolecule's architecture, and, in the process, is exposed to and presumably infected by it. However, he is able to convince her to direct Eros away from Earth. The station crashes into the surface of Venus, where the Protomolecule begins assembling a new, unknown structure. Critical reception for Leviathan Wakes has been positive, with Kirkus Reviews giving the novel praise. The book's action sequences were highlighted by SF Signal, and Tor.com wrote that the book had a "satisfying volume completion". Locus Online also praised the book. Wired.com's GeekDad praised the novel for not containing "overly-complex descriptions of the way governments and corporations work" or "made-up words and cryptic names". Leviathan Wakes was followed by the novel Caliban's War in 2012 and Abaddon's Gate in 2013. It was announced in 2012 that Orbit Books had ordered a further three books in the Expanse series, in addition to five novellas set in the same universe. The first of these sequels was announced in September 2013 as Cibola Burn and was released on June 17, 2014 in hardcover, Kindle, and on Audible in the US. On April 11, 2014, Syfy announced that they had ordered a TV series based on the series of "The Expanse" books, especially the first book, Leviathan Wakes. The cable network ordered 10 episodes, produced by Alcon Television Group (ATG). Academy Award-nominated screenwriting duo Mark Fergus and Hawk Ostby (known for the films Children of Men and Iron Man) wrote the pilot; they were to continue to serve as writers, as well as executive producers. The series has been widely critically acclaimed, and was renewed for a second season in May 2015, ahead of the show's December 2015 première. The show was renewed for a third season. The show was dropped from Syfy after the third season, but Amazon has picked it up and will produce a 4th season. ^ "2012 Hugo Awards". Hugo Awards. Retrieved 2012-10-21. ^ "Announcing the 2012 Locus Award Winners". Tor.com. Retrieved 2012-10-21. ^ "In Brief: Science Fiction". Wall Street Journal. Retrieved 2012-10-21. ^ "Audiobook Reviews: LEVIATHAN WAKES". AudioFile Magazine. Retrieved 2012-10-21. ^ "Review: Leviathan Wakes". Kirkus Reviews. Retrieved 2012-10-21. ^ "REVIEW: Leviathan Wakes by James S.A. Corey". SF Signal. Retrieved 2012-10-21. ^ Walton, Jo. "More like this, please: James S.A. Corey's Leviathan Wakes". Tor.com. Retrieved 2012-10-21. ^ Letson, Russell. "Russell Letson reviews James S.A. Corey". Locus Online. Retrieved 2012-10-21. ^ Kelly, James. "A Great SciFi Mystery in Leviathan Wakes". Wired.com. Retrieved 2012-10-21. ^ "Some Big News About The Expanse". Danielabraham.com. 2012-03-29. Retrieved 2014-04-30. ^ "Cover Reveals! CIBOLA BURN by James S.A. Corey and THE WIDOW'S HOUSE by Daniel Abraham". SF Signal. 2013-09-06. Retrieved 2014-04-30. ^ "A night at the space opera, by Ellen Wright". 29 October 2013. Retrieved 2014-04-14. ^ Dragon, The (2014-04-11). "The Expanse - Syfy orders Drama based on Leviathan Wakes". Spoilertv.com. Retrieved 2014-05-26. ^ "The Expanse". Rotten Tomatoes. Retrieved 2015-12-23. ^ "The Expanse Renewed For Season 2 By Syfy!". Seriable. 2015-05-15. Retrieved 2015-12-23. ^ Spangler, Todd (2019-01-19). "Amazon Launching 'The Expanse' Seasons 1-3 Worldwide Ahead of Season 4 Premiere". Variety. Variety Media, LLC. Archived from the original on 2019-01-29. Retrieved 2019-03-28. Amazon picked up the fourth season of “The Expanse” after NBCUniversal’s Syfy cancelled the show last year. The blog of the authors. The web site for the series.